Interesting, dark and twisted. Stellar acting. It can become a little predictable. The low-budget is obvious when it comes to certain aspects of the film. Now, perhaps you’ve heard of Armistice before, maybe under it’s old title of Warhouse, but if you haven’t, here’s a little background. Armistice is an independent UK movie, written by Benjamin Read and Luke Massey, who I’ve determined, after watching the film, are both incredibly twisted (in a good kind of a way). I think that might apply to everyone involved actually, and I’m all the happier for it. Armistice surprised me, I have to admit that. I expected something different, less gripping perhaps, since I have a hard time imagining a film that focuses on solely one character and does so successfully, but after the 90 minutes flew by, I realized I didn’t even notice the passage of time. 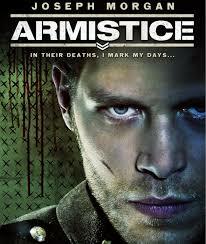 Armistice is for the most part a one man show, with Joseph Morgan‘s A.J. 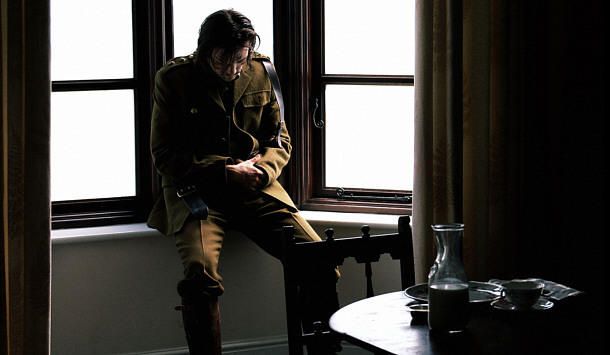 Budd as the main character, a Royal Marine trapped in a house of horror. The funny thing is that even though he has to face what we come to perceive as a monster every single day, the creature isn’t the worst thing about the house. I think that is where the brilliance of the movie comes into play. It’s basically preying on our own fears, removing the main character’s freedom, limiting his choices and slowly stripping him of his humanity. A lot of the time we’ve become desensitized to violence, to cruelty, even to the things that go bump in the night, but this isn’t actually about that. This is about our own fear of becoming our worst nightmare and that’s something we’ll never quite get over easily. Long story short: A.J. Budd wakes up in a strange house, puts on his uniform and gets ready to leave, only to find himself attacked by a strange creature. The process repeats itself every single day, like clockwork, with little variation. Everything other than the creature and the way it dies stays the same. The food, the drinks, the perpetually locked door to what he perceives as freedom. Nothing ever changes until he encounters the diary of someone that had been trapped before in the house, Sterling, played by Matt Ryan. His own tales of horror provide A.J. with some insight as to who or what the creature that haunts him is, and how he could find the way out. I think the particular revelation that stems from this find is possibly the only predictable thing about this movie, but everything else redeems that little flaw. It’s almost amusing how we actually learn more about Sterling through his written words than we learn of the main character, though that could be just my own perception. Still, A.J. is the one most viewers will sympathise with, the one that we’ll struggle to understand, through jumbled bouts of hysteria, mixed with periods of depression and anger towards everything that’s happening and that he can’t stop or change. His unwillingness to give up is what reminds us that despite everything going on around us, resilience is one of the most preeminent human attributes. Joseph Morgan does an amazing job at taking us with him as he struggles towards his freedom, each emotion raw and unfiltered. His anger and desperation aren’t pretty, nor is the depression that seems to settle in as the futility of his actions slowly sinks in. Top marks for that. Matt Ryan has a lot less screen time, yet he makes the most of it. Sterling’s own insanity, his own anger and desperation fuelled actions are brought to life with a sort of subdued grace, but aren’t any less impressive. There’s less impetuosity, though as days trickle into months and years, that changes. 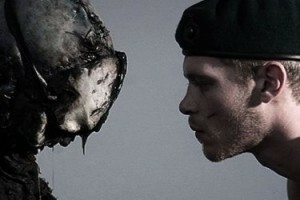 The deterioration of the human spirit is ultimately the thing that Armistice portrays and it does so brilliantly. The limited budget and the time constraints are obvious when it comes to the creature, the Fallen that torments our hero, though as the film slowly unveils its mysteries, the choices made to portray the “monster” the way it’s brought to life become obvious. I’ve come to expect the unexpected from Benjamin Read and he didn’t disappoint this time around either. Little money usually means a less than stellar film, however the atmosphere it manages to create is enough to sustain the mystery and the tension that kept me glued to my seat. Armistice is a movie that you’ll either come to love or that you’ll hate passionately. I’m not saying it’s in any way elitist, made for a select few, but the way the story is built up, it’s just not something that most people will enjoy. The word horror has become associated with blood and guts and gore, and while Armistice isn’t free of these three elements, the focus is more on the slow disintegration of someone’s psyche, trapping us in the same head space that A.J. finds himself in and less on the more physical aspects of things. That’s not everyone’s cup of tea and that’s perfectly alright. I won’t tell you what the big reveal is at the end, you’ll have to figure that one out for yourselves, all I can do is tell you to do your best to get your hands on a copy of the movie, because it will surprise you and if you weren’t a fan of the actors before, you will be after watching. Also, a little hint, there’s a post-credit scene, so stick around for a little longer once you’re done watching. Improper Books titles go digital!